Blackmer S Series pumps are now available throughout the EMEA and Asian markets. Available with or without external timing gears and bearings, Blackmer S Series pumps are self-priming double-ended positive displacement pumps, designed for demanding applications. Blackmer’s twin and triple screw designs provide complete axial balancing of the rotating screws and their timing technologies eliminate metal-to-metal contact with the pump. S Series pumps are ATEX-certified for use in explosive or dangerous environments, and have been specifically designed to address the difficult pumping challenges found in the oil & gas, process and marine industries. Blacker says the S Series pumps provide solutions that can meet the toughest application challenges regardless of temperature, viscosity or pressure. S Series Twin Screw Pumps (WTG) are double-suction, self-priming twin screw pumps with external bearings and timing gear transmissions. They are especially suited for the delivery of fluids free of solid substances and/or with little abrasives. S Series Twin Screw Pumps with non-timing (NTG) gear transmission feature a single-suction design and are ideally suited for transferring lubricating fluids with higher viscosities, such as bitumen and residual oil, at medium or high temperatures. S Series Multi-Phase Twin Screw Pumps have been designed for medium- to low-pressure applications, which Blackmer says are robust, reliable and built to last within the water and oil & gas industries. Multi-phase pumps are commonly used in the oilfields that have untreated streams and are ideal for higher differential pressure and higher suction pressure applications. S Series Triple Screw Pumps are specifically designed for handling clear, lubricating liquids without solid content in the most demanding applications. 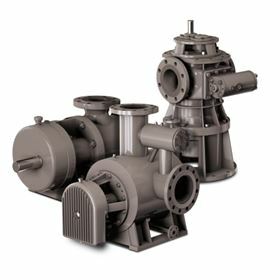 Providing a smooth constant flow across a wide range of viscosities, temperatures and pressures, the company says these pumps are reliable, compact, self-priming, low noise emission and environmentally friendly.